Noted Fiber Artist Kerr Grabowski leads us through the exciting process of creating texture and imagery using her Deconstructed Screen Printing methods. Kerr's process capitalizes on the resist properties of dried thickened dye on a screen, creating painterly, spontaneous and organic prints. 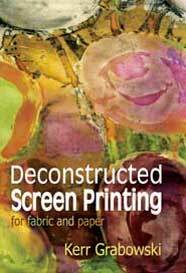 Deconstructed Screen Printing (DSP) is the crossroads where artistic intent and the "happy accident" merge. For beginners and experts alike, this video covers the basics and demonstrates techniques that while easy to use, will yield sophisticated results that are sure to trigger the experienced artist's muse. 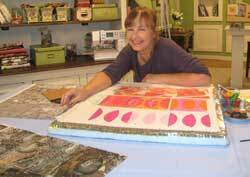 A nationally known fiber artist, Kerr developed Deconstructed Screen Printing in the early 1990s and has been experimenting with and teaching it ever since. Her teaching style is clear, inspirational and non-dogmatic. Included are detailed instructions on building and stretching screens, assembling a print board, choosing squeegees, mixing print paste and fiber-reactive MX dyes. Kerr demonstrates two basic screen printing stencil techniques (wax and paper), and then goes on to exciting variations of her Deconstructed Screen Printing technique. In addition to Kerr's instruction, this video is full of inspiring samples of students' work and a Gallery of artists using DSP in their own work. Deconstructed Screen Printing will help artists wanting to "get out of the box" transform their work on fabric, paper and anything that can be dyed. Learn quick and accessible strategies for making marks that speak to you. them to develop your own unique vocabulary. 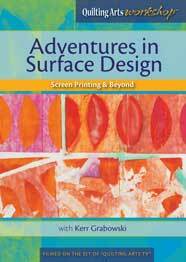 Begin with an introduction to basic screen printing with non-toxic textile paints. You will learn to make and use paper stencils; discover how to design an overall pattern using a simple repeat; and create simple two-color prints. All of these techniques are methods for creating simple images that can stand alone or become background images that can be worked back into. Then, using media such as Caran d’Ache Neocolor II crayons, chalk pastels, charcoal and more, Kerr demonstrates ways to use and how to make this “fugitive” media permanent on fabric and other substrates. You’ll learn how to work back into your pieces using the "fugutive" media to easily add details, enhance color, texture and unify designs. 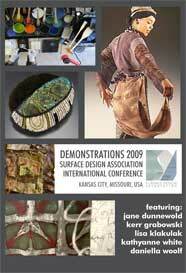 The 2009 INTERNATIONAL SURFACE DESIGN ASSOCIATION “OFF THE GRID” Conference brought together a world-class group of artists and educators to Kansas City, Missouri, USA in May 2009. I am working my way through the second disk ...watching it then trying it myself. A great way to learn by doing. WHAT A WONDERFUL COMBINATION OF LEARNING AND HUMOUR. HARRY MADE QUITE AN IMPRESSION! BRIAN KEEPS POPPING HIS HEAD ROUND THE DOOR WANTING TO KNOW IF I NEED ANY SCREENS CLEANED. WHAT HAVE YOU DONE! AM WAITING FOR SUPPLIES TO ARRIVE AND THEN THE PLAY WILL BEGIN. MANY THANKS. WHATEVER HAPPENED TO THAT EXTRA PIECE OF DUCK TAPE? I just wanted you to know that I just watched your DVD and thought it was FANTASTIC! You have inspired me to give Deconstructed Screen Printing a try. Your instructions were very clear and concise. Perhaps one day I will be lucky enough to take one of your workshops. I started watching your DVD. I really like it; it's very good. You go slowly and patiently. It's a great teaching tool, and inspirational too. Thank you for doing such an excellent job and adding to the field in this format. This is SO much more effective than reading about the process. I like how you just keep printing and printing and printing... that is how it is. Anyway, i found your dvd much more profound and interesting and i'm looking forward just to do some experiments. Paypal is a safe, easy way to order online. If you have never used paypal, the following will ease you through. After clicking on "add to cart" you will be taken to a page showing your purchase. Shipping is calculated and added automatically. Click on check out with paypal. You will go to a page giving you a choice of paying with paypal or your credit card. If you have a paypal account, log in to paypal. If you do not have a paypal account, look near bottom of page near credit card images and click continue. You will be taken to a page asking for your credit card information. Next you will go to a page asking for your shipping info. I will email you when your DVD is shipped. 1 DVD - $6.50 Add $3.00 for each additional DVD ordered.